We are unifying the user experience for the different types of proactive detection alert. 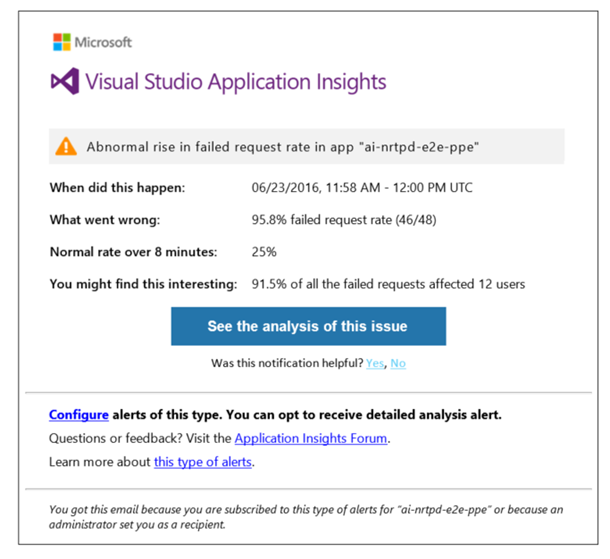 By now you are probably familiar with these emails from Visual Studio Application Insights. You get them automatically about issues in your application, such as a sudden raise in failure rates, abnormalities in request performance, or page load time. There are, in fact, several different types of proactive detection. But now we’ve simplified things so that you don’t have to remember the different ways to consume them. All proactive alert notifications now have a similar look. They tell you not only what the problem is but also give some related information about what might be causing it. To review all proactive detections within a selected time period, there’s now a single view in the portal, the Proactive detection blade. 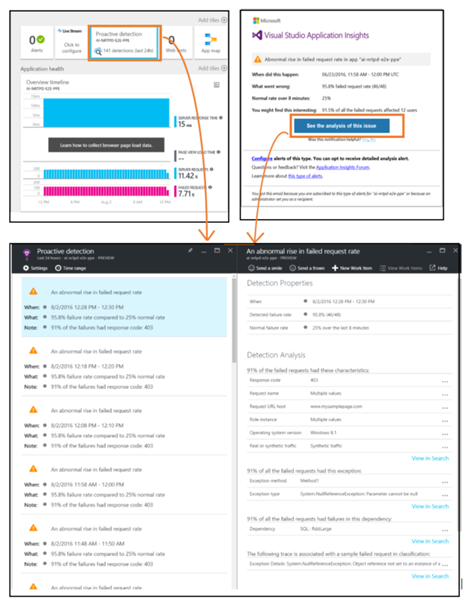 The blade can be accessed from the Application Insights Overview blade->Proactive detection tile or from the e-mail notification-> Blue button inviting you to further investigate the issue. From each detection listed in the Proactive detection blade, you can drill down to specific detection details and begin the investigation. This will allow you to receive a holistic view about the issues that were proactively identified in your application, triage them, possibly identify the root cause, and provide you with more data to support your decisions about how to approach the detected issues. There are three different types of proactive detection. We use machine learning to set the expected rate of failed requests for your app, correlating with load and other factors. If the failure rate goes outside the expected envelope, we send an alert. • Abnormal rise in request failure rate. You get these if you apply Application Insights to Azure cloud services. For any questions or feedback, please visit our Application Insights Forum. For any feature requests, please visit our User Voice site.